We are finally into the dog-days of Summer where the weather has been hazy, hot and humid. You know those days when it's at least 90 degrees outside with humidity at 70% or higher. You walk outside your door for two minutes and your soaked in sweat and can't breathe. Yup, those type of days! One way that we like to cool off on those hot summer days is by sipping on an icy cold treat and this recipe from Sparkling ICE really hits the spot! I think it's the perfect icy-cold refreshment to serve at your summertime parties when you don't want to serve any booze! Pineapple Sorbet: In blender, puree pineapple chunks with sugar and Sparkling Ice Coconut Pineapple until smooth. Chill pineapple mixture in refrigerator for 1 hour. Freeze in your ice cream maker according to the manufacturer's instructions. Store in tightly covered in freezer until ready to use. In two 12-oz. glasses, add 3/4 cup Sparkling Ice Coconut Pineapple. 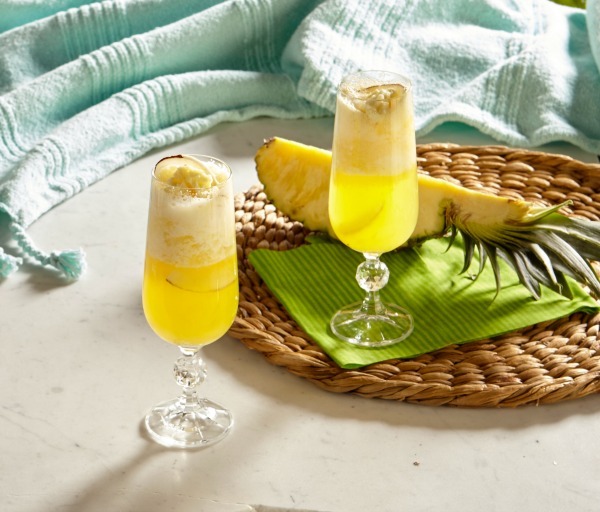 Using small ice cream scoop, add 1/3 cup pineapple sorbet to each glass. Garnish with fresh pineapple wedge and coconut flakes. I love drinks with Sparkling Ice and fresh fruit. Pineapple is one of my favorite fruits.